I recall how, many years ago, an overseas visitor (with a kickboxing background) came to our dojo to train. After the lesson he went over the heavy bag and proceeded to kick it with a roundhouse shin kick. He kicked the bag so hard it swung up to the roof. If you know heavy bags, you’ll know how hard that is to do. The demonstration was nothing if not impressive. I knew very well that it was intended to impress. 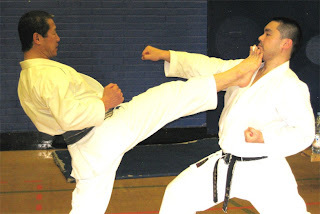 More than that, it was intended as a negative comment on our own (karate style) front snap (or "shock" as I sometimes call them) kicks - specifically that they are “manifestly less effective than these ‘power’ kicks”. Indeed, if you try to kick a heavy bag with a front snap kick you get a very unsatisfying result: the bag hardly moves and your kick looks rather insipid. I think this is the main - perhaps solitary - reason that muay thai boxers, kickboxers, and hence most modern combat sports practitioners, don’t invest time and energy into developing a front snap kick: it just doesn’t “work” on a heavy bag. And the heavy bag really has been the cornerstone of gloved combat sports training. 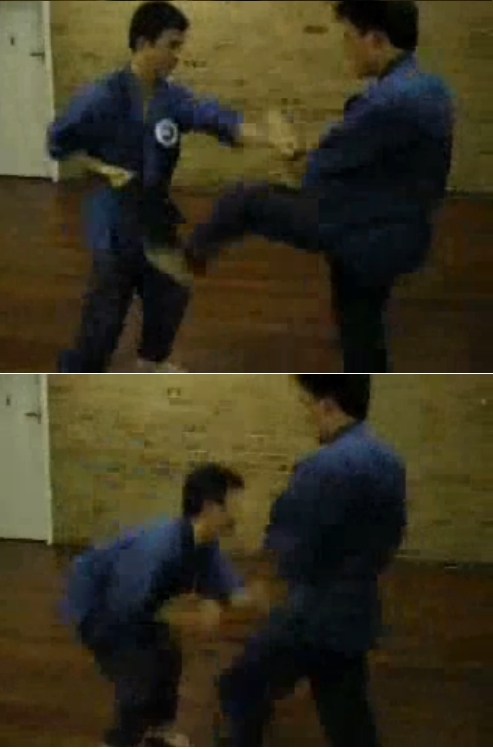 By contrast, other kicks, notably the roundhouse kick using the shin, manifestly “work” when applied to a heavy bag. With enough conditioning to your shin and a bit of practice in terms of coordinating your hip and your kick, you can get the heavy bag swinging quite strongly. Yet no matter how hard you try, front snap kicks still look and feel "weak" when applied to a heavy bag. In this context I am really not surprised to see kickboxers, muay thai fighters, and now MMA practitioners, defaulting to a "pushing" front kick (called the “teep” in muay thai). This is the only one that seems to “work” against the heavy bag, so it is seen as the only front kick that will “work” against an opponent. But I’ve argued before and I'll argue again: the fact that one technique is visibly more “powerful” than another is not the issue. As I outline in my articles “Hitting harder: physics made easy” and "Visible force vs. applied force", what matters is how much force is transferred to the target, not how much force is visible through the target's movement. A push is far more “visible” in its effects (ie. the amount your body is displaced) than a blow. But a push is a push and a blow is a blow. I know which one I’d rather cop. Accordingly, while many in the combat sports world have used their experience on the heavy bag to conclude that the traditional martial arts front snap kick is not an effective technique (and that the “teep” or front pushing kick is better), I find their conclusions irrational or misconceived. Instead of concluding that the front snap kick was the problem, I wonder why they didn’t consider the limitations of the heavy bag as a training tool. Sure, the heavy bag is useful - but is it really the best striking target? I would argue that it isn’t: it certainly doesn’t lend itself to any snap technique because it is simply too heavy and resistant. Generally speaking it is nothing like a human body which is pliable and "deforms" on impact. In this context, the heavy bag has far more in common with a brick wall than it does with a human, standing on 2 legs, receiving your blow. I can understand how the heavy bag came to be the striking target of choice for boxers; any gloved sport requires you to use more “push” (ie. displacement) than you might with a bare knuckle blow. There is also the fact that it is one of the few striking targets conceptualized by early western boxing fighters - and is the principal one among these (others such as the floor to ceiling and speed balls were ancillary at best). By contrast, in Okinawan karate the makiwara (a pliable wooden striking post) was used as the main striking target to very different effect. The heavy bag is suitable for training gloved punches, the makiwara for bare knuckle punches. Regardless, neither is particularly suitable for the front snap kick. Which leaves us with the fundamental question: is the front snap kick really all that useful? So, this leaves us with the more obvious question: if the front snap kick is so useful, why isn’t it being used more, if at all, in kickboxing, muay thai and MMA stables around the world? The answer lies in the relative difficulty, and the specific training required, in achieving a good front snap kick. Judging by their technique, in the last few months it appears at least 3 MMA fighters have done just that: in each case they have effected a textbook “Karate 101” front snap kick to score a decisive knockout. The first of these was Anderson Silva who knocked out Vitor Belfort as is shown in the above gif. "The front kick is classically used to the body. When a guy gets hit in the face, usually it just knocks him backward. But Anderson landed it perfectly, the ball of the foot to the chin." To my mind this shows that the commentator is used to seeing "push" kicks using a flat foot - not a "snap" kick using the ball of the foot (as per karate and other traditional eastern martial arts). The commentator notes that Belfort doesn't appear to react to the kick, possibly because he is expecting the kick to land on the body. I think this partly shows an indifference to push kicks; they don't do any real damage and you can "wear" them relative to other techniques (as I discuss a bit later). However what the commentator fails to note is that Anderson doesn't telegraph the kick. Watch his supporting (front) foot: it doesn't shift or move at all before the kick (where most fighters would turn the front foot out as they commence their kick off the back leg - see Justin Buchholz's kick below, for example). This is, again, "Karate 101". 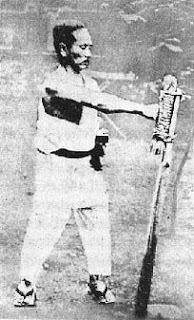 I spent many years being hit with a shinai (split bamboo sword) if I so much as twitched my front foot before kicking. Part of classical karate training is to learn to kick (or step) from one zenkutsu dachi (forward stance) into another with no telegraphing. The other point is that Silva keeps his body movement to a minimum: he doesn't bob up or make any extraneous movement during the kick. In summary, what Silva shows here is near-perfect traditional technique in the basic front snap kick. The second recent example of a front snap kick knockout was the infamous “karate kid” kick scored by Lyoto Machida against Randy Couture. That technique is a kind of jump kick, but it is a front snap kick all the same. The only real point of difference is a little "hop" or leg change. In karate this is called "mae tobi geri" (front jumping snap kick) - a variation on the basic mae geri (front snap kick). And the most recent (that I’m aware of) - and possibly the most classically “karate-like”, example of a front kick knock out is that scored by Justin Buchholz against Steve Lopez. It is worth noting that the kick employed in any of these 3 examples would have failed miserably against a heavy bag. Yet it was supremely effective against a human body. What is also interesting in the Buchholz example is that he kicked in precisely the same way as the (much lampooned) karate basic "air kick" is practised: from a zenkutsu dachi (front stance), snapping out and returning to another zenkutsu dachi. This is clearly evident from the adjacent frames. against using front snap kicks ("they just aren't powerful enough!" - as if only techniques effective against a heavy bag were "powerful enough" for use against an opponent). But I know it won’t stop the arguments. Critics will start distinguishing these examples on myriad fine (and flawed!) points (“this was an exception to the rule”, “Lopez made a mistake”, “this isn’t really a karate technique” etc.). Others will try to argue that they always knew the front snap kick was useful (and if so, my question to them is “then why haven’t you been using it?”). Others will create a straw man by asserting that we “proponents of the front snap kick” seek to argue that it is an “invincible technique”. It is nothing of the sort and I have certainly never made that argument. It is just another technique that just happens to be supremely useful in the outside edge of the melee range. On my way home from work I walk past a kickboxing/MMA gym where I regularly see people circling each other in sparring, both assuming that they are out of range when they are, in fact, in the ideal range for a front snap kick. Because they are unaware of this, they don't expect a front kick and take no precautions against it. This is precisely what happened with the 3 fights featured in this article: one fighter assumed he was in a "circling" range rather than an "engagement" (ie. melee) range. The other fighter knew better. I'm fairly sure that as the awareness of the front kick increases, fighters will be less likely to "circle" in this range. But if front kicks of some variety have always been around why weren't fighters more aware of this range issue? The answer is that the front snap kick succeeds where poorer copies (notably the dreadful “teep”) fail. Many fighters will stand in the "teep" range because that technique is relatively slow and, frankly, not terribly concerning. When have you ever seen “knockout by teep”? I venture that you never have and never will. Pushes are pushes. Blows are blows. So, in summary, the heavy bag does not decide which techniques are useful and which are not. And the front snap kick is a very useful technique indeed; not so much to the face but to the lower abdomen (eg. the bladder or even as low as the groin). In fact, it is as a low abdominal kick that the front snap kick really "shines" in the melee. It is less an offensive technique than a defensive one: if someone comes into your personal space with intent to harm you, you can unleash a quick snap kick to the lower abdomen. I've found it to work very effectively indeed; it can drop your opponent on the spot (especially if you kick below the strong mid-abdominal muscles and your opponent does not tense in expectation of the kick). This is a standard karate tactic for use in civilian defence. Offensive front kicks - especially ones to the face/head - are useful in combat sports, but less so in civilian defence. An out-take of a 2 person version of the kata gekisai dai ni, featuring a low front snap kick that wasn't deflected or evaded. Until that day I'll have to continue to endure arguments such as "blocks are impossible to effect", "you have to be The Flash to use them" and "they would be used in MMA if they really worked". Well, similar arguments (in particular the last one) were put to me in relation to the humble front snap kick myriad times over the last 2 decades or longer. Excuse me while I indulge (just for a moment) in saying "I told you so." As always I enjoy reading your articles. They are always well thought out and the video examples are very helpful as well. In my situation I use a hanging heavy bag and a standing heavy bag for practicing my striking. Regarding the front snap kick, I practice it with the intent of making the bag "shudder" by setting my target 2-3 inches within the surface. When I've completed a successful kick the bag doesn't swing, but jumps slightly. Conversely, if I employ too much hip, or don't snap back quickly enough, the bag will swing, and the feedback is more of a push (which is not my intent). The only time I ever needed to defend myself using karate (Shotokan) I used a front snap kick to the person's lower abdomen and he dropped straight down. I finished with a reverse punch and that ended his aggression. I've always been a "believer" in this kick and practice it more than all other kicks due to its simplicity of use. Well said Gerry. If you're going to use the heavy bag for front kicks, make it "shudder" (shock kick) - don't push. And yes, the front snap kick to the lower abdomen is "king" of all kicks. It is the simplest and the best. I absolutely agree that techniques such as forearm "blocks" will manifest in the ring and be touted as revolutionary. There is value that is only being discovered now due to exhausting "practical" techniques in the ring. Thank you for a very analytical look at a very "simple" yet refined skill set. Simply brilliant. You totally changed and widened my outlook on karate forearm blocks, and then this. Favorite blog. EVER. As always, great article Dan! As a Kyokushin practitioner myself, I was very pleased with the quote from the president of our organization (Matsui). I also favor an effective technique that shocks instead of displaces every day of the week. The mae geri is a techinque that is visually very simple, underrated and not so "glamorous" when compared to a jodan mawashi geri, however executing it correctly with a shock will take lots of practice. The snapping mae geri can be executed really fast, without much body movement, "teleporting" and compromise of your posture. Obviously a well trained karateka can execute any technique without comprimising posture but kicks such as the mawashi tend to be harder in that regard. Also as you said, a front snap kick to the lower abdomen is a real killer, with your guard up it is really hard to block if executed fast enough. Check out ths video from one of the Sempai of my school at a tournament, notice the snapping front kick at 0.44. The opponent didn't see it coming, it was performed effortless and knocked the wind out of the him. Notice the quick withdrawal of the leg and that there was no push, but instead a shock. Thanks Alonso for that valuable contribution! I honestly love your blog, I believe firmly in the technique behind traditional martial arts and deeply regret not having had the opportunity to grow with them like some of my peers had. I have to say from a standpoint of rhetoric, your usage of the very fighters some would argue are proof of concept against these tried-and-true tools, is not only very classy and tasteful, it's utterly brilliant on a rhetorical level. Anderson Silva is an amazing fighter and honestly, I think his use of traditional technique in a place that often shuns them shows not only a form of respect to the styles that came before, but is a silent nod that the naysayers are only blowing hot air. Even to see Randy Coutoure--another personal favorite of mine--fall victim to the technique makes me shake my head in disbelief. And another thing, I wanted to say I like what Gerry Boyce had to say. You have the tools in front of you, you have to learn to repurpose them as the time comes. I think, personally, part of what makes a martial art an art-form, is coming to the realization that you're not learning how to paint the Mona Lisa, you're really learning how to set up your paints, where to put your brush to the canvas, and how to make it come together in a beautiful way, something that was originally someone else's in concept becoming uniquely individual and personal, if not entirely new. You make some excellent observations. I particularly like your analogy "that you're not learning how to paint the Mona Lisa, you're really learning how to set up your paints, where to put your brush to the canvas, and how to make it come together in a beautiful way, something that was originally someone else's in concept becoming uniquely individual and personal, if not entirely new". Great stuff! I've noticed the MMA fighters that get hit by the front snap kick, saw it coming, but their reflexes were trained for a side kick to the thigh so they lifted up their leg and guarded their chin when they weren't certain what kind of kick is coming. This says to me that their training is designed to counter conventional MMA practices. Stuff "most" people do. But what most people do aren't actually the most dangerous attacks they need to deal with. So focusing on defending against everything, simply means they're still getting caught by the more offensive natured strikes. What most people do is hang around at extreme H2H range and go in and out trying to touch and test each other, hoping and waiting for some kind of opportunity. Or they're hanging at range and seeking to damage the other guy's legs and reduce their mobility (over like 5 to 10 leg kicks). They're doing this because they're worried about getting knocked out or damaged, so they're holding back. But that counts on an absolute defense, which is not such a certain thing given enough time. Given enough time, any attack can penetrate any defense. The other way around isn't true, however. Given infinite time, a defense will not stop all attacks. When a person is injured, they can't defend themselves. Even the guy that got snap kicked in the spleen, was perfectly fine standing up, but he automatically went on the defensive and gave up any idea of attacking because he knew he was damaged and needed time to recover. That's not even an injury, just a painful body hit. A ruptured spleen comes from fully translating the body weight into the snap kick and basically falling into his spleen on the way down. If you miss, you're now jumped into his space and maybe you'll get tripped, but you can take him down or use hand strikes at that close a range. If you don't miss, he's out of the picture. Given that kind of odds, I wouldn't want to be constantly defending against attacks that can do that much damage. But in MMA, such powerful and fully committed attacks, you almost never see. I only see it when one person clearly understands that the other person is hurt and can't defend himself. Then he fully commits to an attack. And even then, the attack is not exactly anatomically dangerous. The rules forbid that. I often wrote on Yahoo!Answers that there's two skill sets in H2H training: the ability to execute attacks and techniques, and the ability to teach the execution of such to people who can't do it. They are different skill sets and it is very rare to find someone who can do both at once, since usually a person only has one talent: doing or teaching. Finding someone who can also describe the physical motions of 3d bodies, is another thing requiring artistic and descriptive skills. Communication, teaching, and execution. There are far more people who can execute an attack right, that can't explain how they did it to someone else or reproduce the results for someone else. There's a lot of people who can teach well, but don't understand specific niche subjects well enough. Many artists and communicators exist. But you don't find someone with all 3 skill specializations often. In trying to combine internal and external, I have a few ideas you might want to try out. The internal strike relies upon body weight in motion. Literally, your body must displace the opponent's body, as your strike hits and penetrates through the target. The distance you must penetrate or the distance you must displace him, more is always better but each target has its own little quirks and issues. Some targets like the throat, doesn't require much power, impulse, speed, or mass to destroy. Just enough, is just enough. A more powerful strike would simply cause the wind pipe to be constricted faster and more completely. The external martial artist strike relies upon a sort of extreme speed obtainment at the right distance to the target, such that it hits the target with maximum speed and maximum penetration (supplied by the muscles). The incompatibilities I see is that internal strikes require structure to reflect the force into the target, otherwise you're just running into someone and then pushing them. That results in more injuries than most people realize (check out sports injuries in basketball/hockey/football/etc), but it's not "skill". The question of combination then becomes, is there a timing you can have where your hand strike has maximum speed, yet also maximum structure the moment you transfer that speed and no longer need it? Meaning, a two phase hit. The initial hit combines the force of body weight in motion and speed of the fist, and the second phase decreases speed of fist to zero and transfers all focus to correct structure. I don't think I have the resources or experience right now to experiment on that little issue, but you might. If you examine a strike like xingyi' beng quan you will see something like your 2 phases. This is facilitated by the stepping. See http://dandjurdjevic.blogspot.com/2011/01/xingyi-stepping-vs-karate-stepping.html. To maximize speed even further, you could use a cross punch, but this would leave massive openings and cause over-committment. Thanks for your input! Also Ymar, for more on internal/external hybrids see http://dandjurdjevic.blogspot.com/2008/10/goju-ryu-as-internal-art.html and http://dandjurdjevic.blogspot.com/2009/06/can-karate-become-taiji.html. One of the reasons why people should train as they fight is not because "their techniques don't work in a fight". It's because their BRAIN doesn't need to be thinking about doing useless things in a fight. If you see the video, that guy "saw" the kick and reacted. But he reacted wrong. Has little to do with being slow. He wasn't slow. His brain was just thinking of the wrong thing. And that's what happens when people expect to use attacks in a strange environment, when they don't train to use attacks in a strange environment. It's also a sign that the brain has been trained to react, by rote, to certain stimuli, when in a fight one should not be reacting so much as acting and forcing the foe to react to you. This isn't "technique'. It is tactics and strategy. For a bunch of people that like to do "combat sports", they seem to not really understand tactics and strategy. Thus supporting my contention that "sports" don't have anything to do with "combat"... at all. To me, the biggest problem wasn't that each of the people knocked out reacted incorrectly to the kick - but rather that each was standing directly in the optimum "firing line" for a front kick, oblivious to that fact. It is very hard to deflect or evade a front kick at that (ideal) range, so if you "circle" at that range, you do so at your peril. So I see this less as question of incorrect reaction, and more as a question of incomplete awareness. Brilliant post. For years practicing on the heavy bag, I was always wondering why the bag wasn't moving much from my snap kick. Makes total sense. I think this may also apply for straight punches delivered in a traditional style to a heavy bag: probably not gonna move a whole lot, especially not as compared with crosses and hooks, etc. "...the front snap kick to the lower abdomen is "king" of all kicks. It is the simplest and the best." With him being very knowledgeble using various sources ranging from military to martial artists I did not stand much of a chance with me merely trying to think of things that could make the mae geri a better alternative. "With him being very knowledgeble using various sources ranging from military to martial artists I did not stand much of a chance with me merely trying to think of things that could make the mae geri a better alternative." First, most people outside of traditional martial arts don't have a clue how to do a proper front kick. It isn't like a soccer kick (which is similar to a shin kick) etc. It requires specific training and a specific skill set that takes a while to acquire. Once that skill set is acquired, then it becomes very effective. The fact that it might not be used so much in the military etc. (where the goal is to train soldiers quickly, not to teach them a martial art) does not surprise me. Second, you seem to take your friend's "experience" as gospel. Is it his own experience, or is he recounting that of others? Does he know how to do a proper front kick? In the end, I've trained in all kinds of kicks. My experience is that it is "king of the melee". I walk past a boxercise gym every day and see people circling each other in a range where they would be given a very quick, nasty kick to the guts. They are oblivious to that, as many eclectic/modern/sport enthusiasts are. I am wary of standing in that "no-man's land". For civil defence purposes (not sport and not military), kicking someone in that range (just out of punching range) is your first possible weapon. I have found it to be supremely effective - and I've seen the doubters doubled over after walking into such a kick. My advice: don't take your friend's. The front kick works. Stick with it, develop it. It isn't designed for sports, but as we've seen recently, it even works there. Sports and "reality-based" perspectives are, I believe, shaped by inexperience with what is a deceptively complex movement (to perfect, at any rate) and (most importantly) the "feel" on a heavy bag. All their other arguments follow as "after the fact" justifications to support this conclusion imho. Thank you for a very good reply! My friend has very little personal experience in these matters, however he does read alot regarding the subject. I feel that your answer, however, does not answer one of his very valid points. He claims that a low kick is quicker and that it can quite reliably knock someone out with one shot. Surely it does not have the same range, but when you do get in close: is it not a superior alternative? By "low kick" I presume your friend means a low roundhouse kick using the shin. This is a kick that follows an arc, not a straight line like mae geri. A straight line is the shortest distance between 2 points, so the mae geri is necessarily quicker. As to knockout... A kick to the thigh might hurt and with unconditioned persons can even put them down. But is it a knockout blow? No. A sharp, low mae geri to the bladder or groin is much, much more potent. Why do so many prefer the low roundhouse shin kick? It is what untrained people naturally do - ie it is like a football kick. Can that work? Yes, but it isn't faster or more effective than a front snap kick. The latter is also far less telgraphed. You have me convinced, thanks. Fantastic article by the way! Recently, there was an awesome UFC fight between Jon Jones and Rashad Evans for the Light Heavyweight Championship. It was a truly exhilarating fight. Your prediction came partially true. The front snap kick was used in abundance by both fighters. On top of that, Jon Jones seems to be gradually discovering/incorporating techniques from TMAs. His elbows seemed to be some sort of hybrid between Muay Thai elbows and Bajiquan elbows, at some times leaning more towards one than the other. It was magnificent. He also uses back kicks a lot, and it seemed this time that he started to show hints of TMA in his blocks, too, rather than just wildly flailing or shielding. That fight truly brought a smile to my face, the more I watched it. Coming back to this post after a year, I think it is quite interesting to note that in the past year, I have not once seen a teep performed in the UFC. Of course, I haven't been watching every fight, but it used to be in almost every one. Now, I see lots of people throwing front kicks. I wonder what your reaction to this is. I've noticed that too Mohammad. Nary a teep in sight now. Front snap kicks are all the rage. It's funny how people can believe something is impossible simply because they haven't seen it done before (albeit that none of these people has sought to test the issue adequately). They assume that "someone would have done it already were it possible/feasible". The same narrow thinking made many people from past centuries accept, uncritically, that human flight was "impossible", among other things. It took two bicycle building brothers with an engine made from old cans to show the principles of "lift". And so it takes a couple of "tail blazers" to demonstrate something in martial arts (something that is eminently discoverable in logic) before it is accepted as "possible". After this, nary a person can be found who will admit that he or she ever thought it was impossible. So it is with the front kick. Try to find anyone who will admit to saying that "front snap kicks don't work" and you'll draw a blank. It's not an issue now. Yet I remember well arguing people on a variety of forums in the early to mid 2000s where they said such things. We even had a chap (who was quite tough but highly skeptical of our kicking) turn up to our dojo and cop such a kick in the guts - yet still he left "unconvinced" (I think he felt he'd been tricked or just caught off-guard). I think it’s worth pointing out a fundamental difference in the two kicking techniques that you are describing. The teep or push kick is intended to displace the attacker’s body. The body is a more massive target, and therefore takes more momentum to displace- this requires that the kicker’s mass is moving forward directly behind the kick. The kicker needs to move his center of mass forward over the support leg so that his momentum is moving at a right angle to the attacker. The thrusting kick has its place, and there is nothing inherently wrong with it as compared to a snap kick- the difference is the context of use. Specifically, in combat sport settings it is a tool for creating distance when an attacker attempts to close to melee range. If you’re not prepared for it, catching one in the mid-section is both highly uncomfortable and has the effect of leaving you open for a follow up as you recover. In an assault situation, catching someone in the mid-section with a properly structured push kick can be very useful in knocking them back as they approach, to facilitate escape, and is an effective way of utilizing your own forward momentum if you need to move past the attacker’s position. The argument that push kicks are an artifact of modern bag training may be true in some cases (i.e., dudes just banging on the bag and mistaking that for the entirety of training), but is not historically accurate. The Southeast Asian fighting arts make use of it (Bokator, Lethwei, etc), and it appears in carvings that are hundreds of years old. A snap kick doesn’t need to have the same structure and relay (aka, driving your mass horizontally behind the kick) as a push kick because the goals are different. The typical targets for a snap kick are the head and groin (although the following concepts can apply to snap kicks to the knees or belly). Both of these targets different from a target’s midsection in two important ways: the first is that the groin is under the center of mass, and even a relatively light strike moving upward into this area has the effect of being “tamped” into the center of mass. It doesn’t take the same forward movement behind the kick as a push kick to the body- the vectors are different. Horizontal for one, roughly vertical for the other. The second difference relates to the head. It is much less massive than the body, and the neck can rotate more freely in more planes than the body will. It also sits atop the mass of the body, and any strike that accelerates it from below or horizontally will cause it to rotate rapidly around the body. You can see that happen in the Couture clip. The kick is usually quicker, because less of the kicker’s mass has to be behind the strike. The contents of the groin are mashed upward against the center of mass, and the head will accelerate faster than the body can, and in different directions. A related observation on why the snap kick is suddenly the "next big thing" in MMA- people who tried higher kicks, particularly front kicks, in the early MMA promotions fared poorly. They got pummeled after it was caught or taken down and submitted. This probably had more to do with the quality of the person's technique than the technique itself. So people stopped trying to use it in MMA type competitions- it was too vulnerable. As Muay Thai became a preferred striking art, people adopted the push kick and roundhouse kicks because they are harder to intercept (dropping your hands for a lower kick invites a blow to the face, and even a caught push kick can still disrupt balance). But once the snap kick to the head got "rediscovered," practically no one in the sport had been training to defend against it, and even seasoned vets like Couture were vulnerable. In his case, you can see that as Machida starts his jump step, Couture response by angling towards it, expecting a roundhouse on that side. He did not expect the front snap kick on the other side, so he ended up eating it. For now it's still relatively new in competition, so people will fall for it for awhile. But before long a new technician will pop up who has trained a defense that exploits snap kick attempts to the head, and it will become just another kick in the arsenal of the sport. Hi Randy, thanks for your contribution. "The teep or push kick is intended to displace the attacker’s body... The thrusting kick has its place, and there is nothing inherently wrong with it as compared to a snap kick- the difference is the context of use." I agree with you observation that there is a time and place for displacement kicks. However, my view is that there is a difference between a "thrust" and a "push". A push is designed to displace. A thrust can be employed to break (eg. joints) or simply to impart force without a snap back (a side thrust kick to the mid section). Either way, its force is still imparted as a blow, not a push. I don't see a "push" "being nearly as useful as a thrust or a snap. "[P]eople who tried higher kicks, particularly front kicks, in the early MMA promotions fared poorly. They got pummeled after it was caught or taken down and submitted. This probably had more to do with the quality of the person's technique than the technique itself. So people stopped trying to use it in MMA type competitions- it was too vulnerable." Yes - they had poor technique. "But once the snap kick to the head got "rediscovered," practically no one in the sport had been training to defend against it, and even seasoned vets like Couture were vulnerable. In his case, you can see that as Machida starts his jump step, Couture response by angling towards it, expecting a roundhouse on that side. He did not expect the front snap kick on the other side, so he ended up eating it." This is the "situational reflex blindspot" of which I have spoken. See my article "situational reflex". "For now it's still relatively new in competition, so people will fall for it for awhile." I wouldn't say they will "fall for it". It isn't a "cheap trick". It is a technique that many people simply ignored - so they stood in the "firing line", totally oblivious to its danger. It would be a bit like saying that if, for example, people suddenly became aware of the jab punch (where previously it hadn't occurred to them to try it), some people might "fall for it for a while". No, it is a valid technique that dominates a particular range (lead, reaching punch). The front snap kick dominates a range just outside that. Both are useful and need to be factored against. "But before long a new technician will pop up who has trained a defense that exploits snap kick attempts to the head, and it will become just another kick in the arsenal of the sport." I prefer to say that before long "people will start taking this technique seriously and not stand directly in its firing line". Yes, then it won't be a clear "knockout technique" all the time. But the dynamics of the fight game will change to accommodate it - as they should have all along (which was the central point of my article)! Thanks again for reading and for your commentary.